Yogurt – one of those foods that are a staple in my house and my eating routine. I’ll occasionally take a break from eating it because like anything you eat with regularity, you get sick of it. But still, I eat it enough that after thinking about it, it was justified to start making it at home. It doesn’t get much cheaper. I bought a half-gallon of 2% milk from a local dairy, then a single serving container of some plain greek yogurt. The cost for those 2 items? $3.68. That means I ended up with 1/2 gallon of yogurt. yep. I’ve paid more than that for the tubs of yogurt. This is so simple to do you’ll be kicking yourself for not doing it sooner. You can make as little or as much as you want, but don’t make more than you can consume in 2 weeks time. 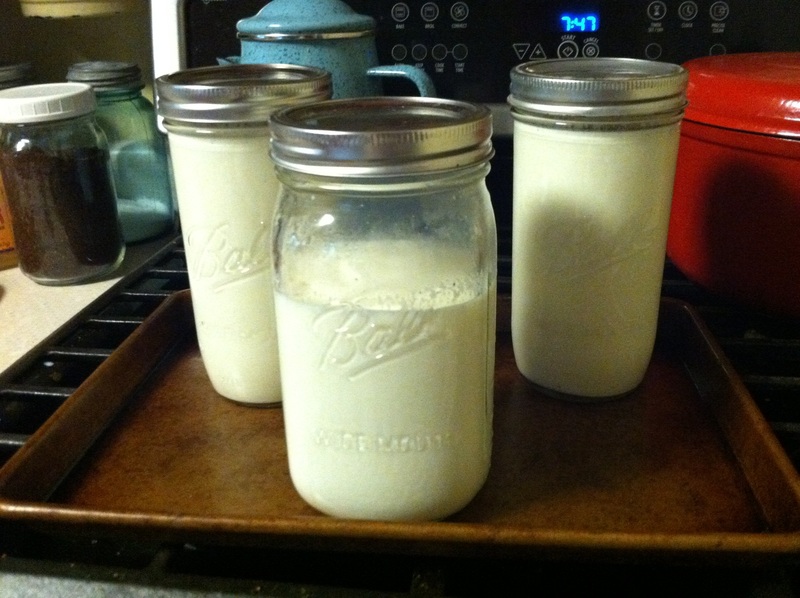 You’ll want to use 2 tablespoons of yogurt per quart of milk. 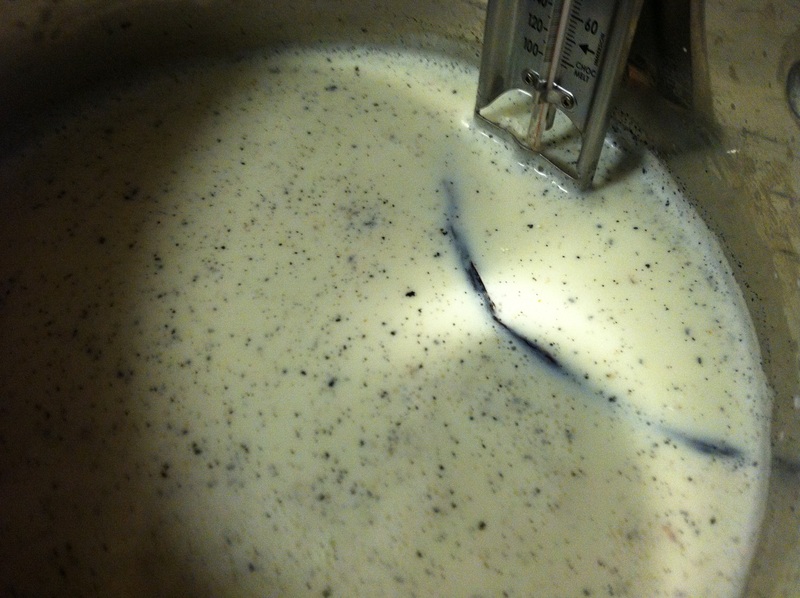 Place your milk in a large pot along with the vanilla bean and the seeds. 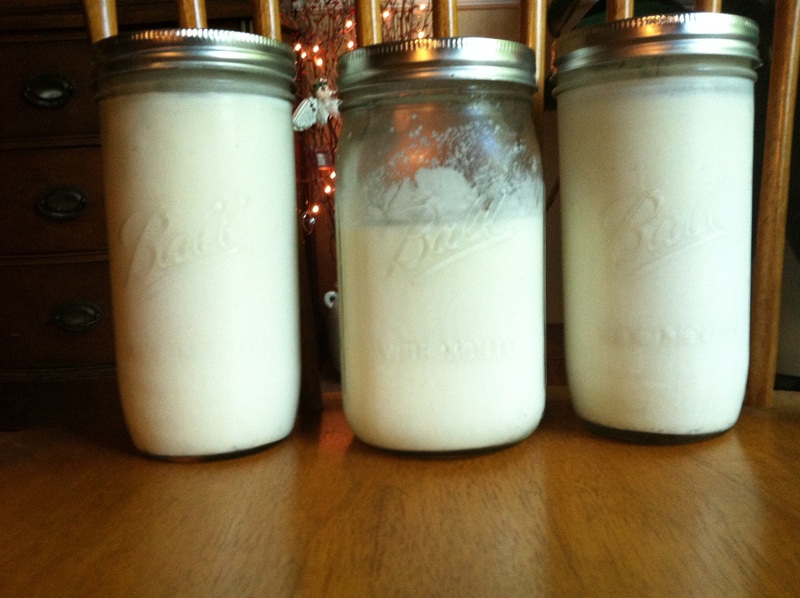 Whisk to break up the seeds and distribute them throughout the milk. Heat until the milk reaches a temperature of 180-190 degrees. Once it reaches that temp, shut the burner off and move from the heat source. Let the milk cool down to 115 degrees. In a small bowl, place the 4 tablespoons of yogurt and add some of the cooled milk. Whisk to combine until no lumps form. Add the yogurt/milk mixture to your milk pot and whisk to get everything mingling. Remove the vanilla bean. Turn your oven on to the warm setting (170 degrees). Once it hits that temp, turn it off. 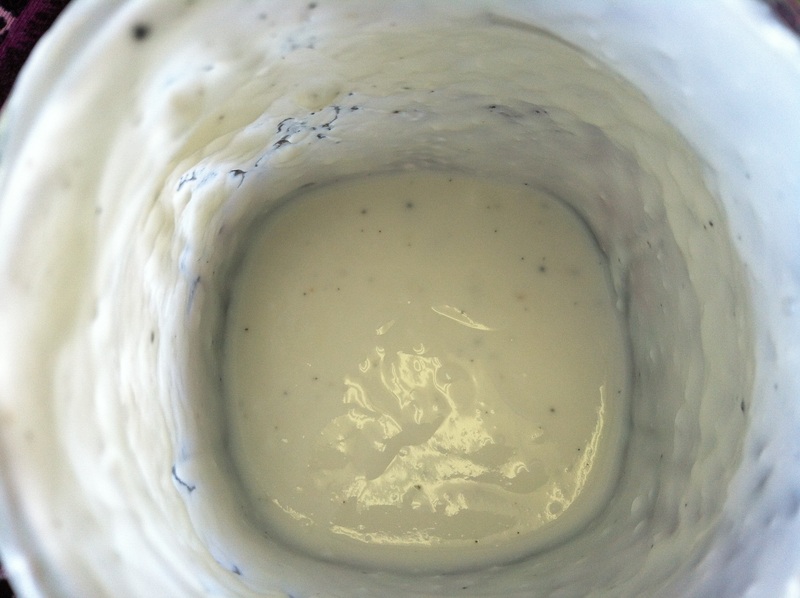 Fill clean jars with the yogurt mixture and put lids and rings on. It doesn’t matter if you do not have the same amount of liquid in each jar, they will all process/set at the same rate. Place on a cookie sheet and put in the warmed oven. Leave them alone for 8 hours. After 8 hours, remove the jars and place them in the fridge to cool and set up more. If a thicker yogurt is desired, line a colander placed over a bowl with a clean flour sack cloth (you can find them at Walmart in the dish towel section) or a double layer of cheese cloth. Pour your yogurt into the flour sack/cheese cloth, cover with another towel and place in the fridge overnight for a greek style yogurt. I drained mine for a few hours and ended up with a nice consistency. Be sure to stir it up because the yogurt coming in contact with the towel will be a thicker consistency. Store the thickened yogurt in your containers and enjoy! That’s it. Very little hands on time and money to get something right from your own kitchen. The taste is a very light vanilla flavor with a good tangy taste. You can add sweetener or vanilla extract if you choose. I added a little bit of agave nectar and it really brought out the vanilla bean flavor! I think vanilla stevia would be a good addition for some more sweetness and pronounced vanilla flavor too.